Vegan truffles and filled beets speak of true love. This Valentine’s Day, consider giving your heart to a vegetarian. Better yet, let your plant-based sweetie bring you over to the vegetable side of the plate and watch your risk of developing heart disease drop. According to a 2012 meta analysis of seven previous studies, researchers at Zhejang University in Hangzhou, China, found that vegetarians have a lower risk of developing heart disease, by 29 percent. In addition, the work of Drs. Dean Ornish, Neal Barnard and Caldwell Esselstyn, among others, shows the ability of a whole foods, plant-based diet (basically a vegan diet with very little processed food) to reverse existing heart disease. So how do you cook up an alluring vegetarian Valentine’s Day treat that is also good for your heart? According to my friends and readers, who responded to requests for special Valentine’s recipes, sweet is the way to go – with one exception. The exception came from Girl Gone Raw cooking instructor Elizabeth Fraser of Portland. 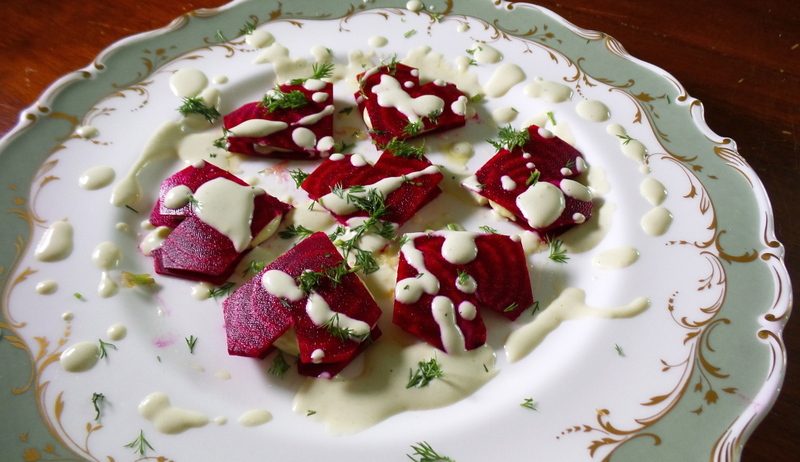 She suggested you treat your sweetheart to Creamy Dill Beet Rawvioli, a dish she made on the cooking show “Vegan Mash-Up.” Make it special for Valentine’s, she adds, by cutting the beet rawvioli into heart shapes. Sweet suggestions I got ranged from a vegan strawberry-lemonade cupcake (find the recipe on chubbyveganmom.com) to a trio of vegan heart-shaped sweets – trifle cake, raw chocolates and Linzer torte cookies – from cooking instructor Lisa Silverman of the Five Seasons Cooking School in Portland. Two other recipes – one for vegan truffles, another for a smoothie – feature a culinary love match: chocolate and peanut butter. Heather Meehan of Durham said her smoothie is her go-to drink on Valentine’s Day morning. “It’s thick and creamy, and tastes like chocolate pudding,” she said. 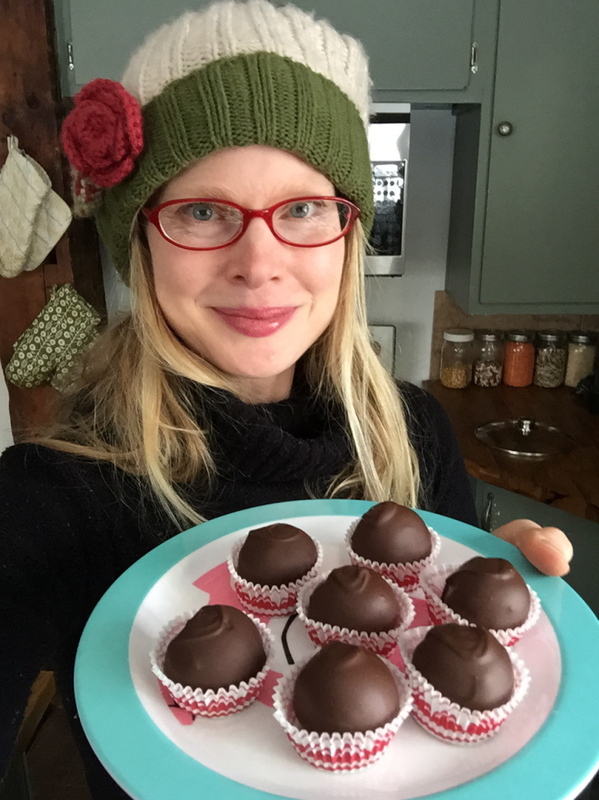 At Christy Ellingsworth’s house in Portland, Valentine’s Day for her husband and two daughters means homemade truffles. An even more decadent suggestion came from Spirited Cook (spiritedcook.com) blogger Barbara Gulino of South Portland. 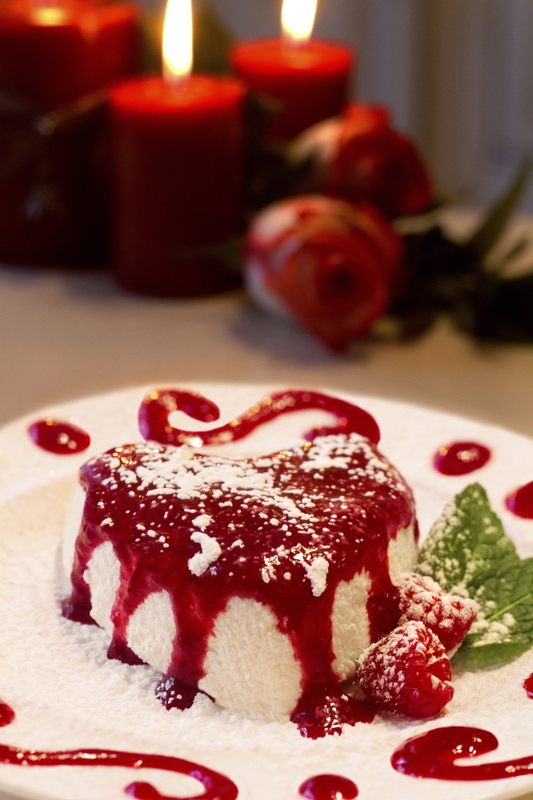 Her White Chocolate Coeur a la Crème with Raspberry Sauce uses cream cheese, heavy cream, sugar and white chocolate. While these last two recipes might not win a spot in the Health Food Hall of Fame, they do show that vegetarian eating has plenty of room for the occasional indulgence. Standard creamy peanut butter works best here; natural peanut butter is too dry. Ellingsworth says it’s easier to melt the chocolate in 2 batches to keep it as fluid as possible for coating the truffles. Measure the sugar, peanut butter, vegan butter and vanilla into a medium bowl. Stir well to combine; you may find it easier to abandon the spoon after the initial mixing and use your hands. Combining the ingredients while the butter is still warm also makes it easier to stir. Keep going until the mixture is completely smooth. Roll the mixture into tablespoon-sized balls. (Ellingsworth uses a small cookie scoop to measure the balls, then rolls them gently in her palms.) Place the balls slightly apart on the cookie sheet. Freeze until firm, about 20 minutes. Meanwhile, measure 1 cup chocolate chips and 1 teaspoon oil into a small pan or microwave-safe bowl. Melt the mixture, either over water on the stove, or in the microwave (heat 1 minute). Remove from heat and stir until smooth. Remove the peanut butter balls from freezer. Carefully drop them (using a spoon), 1 at a time, into the chocolate, coating well. Then gently return each truffle to the waxed paper. Gently swirl the spoon while releasing it for a nice professional look and sprinkle with jimmies or other decorations, if you like. Place the sheet in the refrigerator until the chocolate coating has firmed and set. The truffles keep well in a cool place for up to 1 week or up to 2 weeks in the refrigerator. Serve chilled or at room temperature. To make the filling, place all the ingredients in a blender with 1/2 to 3/4 cup of water and blend on high speed until smooth and creamy. Transfer the filling to a bowl and set aside. To make the rawvioli, wash the beets and trim off the tops and bottoms. Now you can leave the beets as they are or you cut them into square or heart shapes. Set a mandolin to a very thin setting (1/16 inch) and slice. You will need 60 to 64 beet slices. Save any leftover beet pieces for a salad or the juicer. To assemble, get out 4 plates. Drizzle 1 tablespoon of olive oil onto each plate and then mince a little garlic over it. Mix the oil and garlic together. Place 8 beets slices on each plate. Spoon a little ravioli filling onto the center of each beet piece; place another beet slice on top to seal. Repeat until done. Be sure to leave 1 to 2 tablespoons of rawvioli filling in the bowl. Mix it with 2 to 3 tablespoons water. Drizzle this sauce on top of raviolis and then sprinkle with fresh dill and pea shoots or microgreens, if you like. Gulino recommends Callebaut chocolate. To make this recipe, you will need eight 1/2-cup coeur a la crème molds or one 4-cup mold; you’ll also need cheesecloth. Place a medium bowl and mixer beaters in the freezer to chill while you begin preparing the recipe. Allowing for overhang, line the coeur a la crème molds with squares of double-thickness dampened cheesecloth. Break chocolate into pieces in a small bowl. Melt over low heat, stirring until smooth or melt on 50 percent power in a microwave (melting at a lower power will ensure, hopefully, that the chocolate doesn’t seize up, Gulino says, but do this only if you know your microwave well!). Set aside and let cool slightly. Meanwhile, beat the cream cheese in a mixer until fluffy. Beat in ¼ cup of the heavy cream. Add the confectioners’ sugar and beat until combined, scraping down the bowl with a spatula as necessary. Add the melted chocolate and beat until light and fluffy, scraping the bowl once or twice to incorporate. Remove the chilled bowl from the freezer. Pour the remaining 1¼ cup of heavy cream into the chilled bowl and whip it just until it begins to hold stiff peaks. Fold about ½ of the whipped cream into the cheese mixture to lighten it. Fold in the remaining whipped cream until no visible streaks of cream remain. Spoon 2 heaping spoonfuls of this fluffy stuff into each mold, dividing the mixture evenly (or use a single 4-cup mold). Smooth the tops. Fold and gently press the overhanging cheesecloth on top of the mixture. Place the molds on a rimmed sheet and chill for 8 to 24 hours. To serve, fold back the cheesecloth and invert each coeur a la crème on to a dessert plate. Remove the cheesecloth and discard. Drizzle the coeur a la crème with raspberry sauce and garnish with fresh raspberries. Puree berries in a food processor. Strain into a bowl through a fine-meshed sieve, by stirring the puree with a wooden spoon, until only the seeds are left in the sieve, making sure to scrape the bottom of the sieve (“cuz that’s where the good stuff is,” Gulino writes). Add the sugar and liqueur to the strained berries. Taste and adjust if necessary. Refrigerate the sauce until you are ready to use it. Put all the ingredients in a blender with 1¼ cup water and process until smooth and creamy.